The Beaver State’s anual ‘Civil War’ meeting between instate rivals No. 10 Oregon and Oregon State is one of the most demanded games in college football each year. 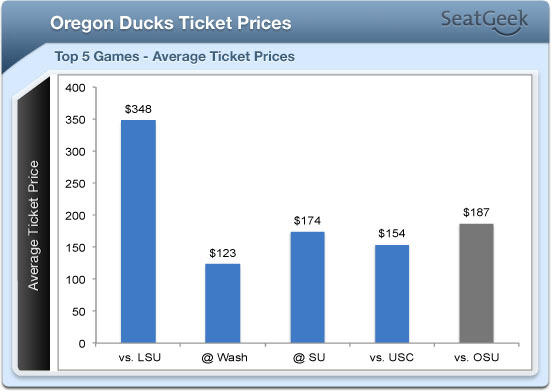 Average ticket prices for this year’s game are currently at $186. The game is by far the most demanded game for Oregon State, but Oregon’s early-season meeting with LSU ($348) edges out the rivalry meeting. 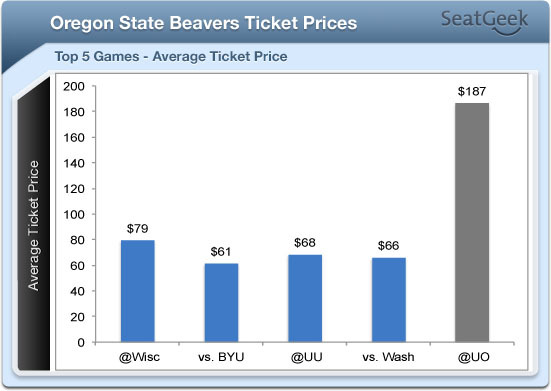 Last year’s Oregon-Oregon State game in Corvallis had an average ticket price of $205, making this year’s game 9.2% cheaper to attend. The Beavers haven’t won the meeting since 2007 when it took two overtimes to do it. Right now, the least expensive seat currently listed on SeatGeek is for $63 in a standing room only section, while the most expensive ticket is for a $828 listing at the 50 yard line in Section 11, Row 54.